John Wayne said, “The most fun I ever had on any picture was on Hatari!” After watching the film, a viewer will have no doubt in their mind that this is truly the case. Hatari!, Howard Hawks’ 1962 safari film, is an adventure ride like none other. The film features Wayne and Red Buttons, leading a team of animal capturers for zoos around the world, when they find themselves making room for the arrival of a beautiful wildlife photographer, “Dalles,” played by Elsa Martinelli. The film’s narrative can be found lacking by even the most casual of critical viewers, due in large part to a loosely scripted production. Originally developed under Jack Warner with Gary Cooper starring, the film’s script had yet to be written when Hawks announced Cooper would be starring in his upcoming “Africa” feature. Shortly thereafter the film fell apart when Cooper, who had signed on to the project conditionally with script approval, opted to drop out. Jack Warner subsequently dropped out as well, which resulted in the production going to Paramount and the inclusion of star, John Wayne. The lack of a script, however, was intentional on Hawks part. The open-ended nature of the story allowed for the film to be built around the heart-thumping animal capture scenes that occupy the film, but adrenaline inducing scenes and settings were no strangers to Hawks’ style. Howard Hawks developed over the course of his career a unique, yet commercially appealing and studio-friendly, style that can be traced through his illustrious and diverse set of films, featuring forty-seven official credits as director. Hawks’ style has been widely influential and can be seen in films from directors including Clint Eastwood, Martin Scorsese, Peter Bogdonavich, Robert Altman, and Robert Zemeckis. Common stylistic tropes and signatures of Hawks’ work include overlapping dialogue and eye-level medium shots, and an avoidance of more complex camera-work, which Hawks believed distracted from the film. Beyond that, many of his films spoke to his personal lifestyle; as a man fond of risk he came to make films such as The Air Circus (1928), The Dawn Patrol (1930), Air Force (1943), Crowd Roars (1932) and Red Line 7000 (1965), that expressed his interests in aviation and auto-racing. Furthermore, Hawks’ films were known for showcasing atypical female protagonists who defied traditional femininity with their determination and confidence, and placed them against conventional, often hyper-masculine male characters. Comfortable in a man’s world, Hawks’ leading ladies were sophisticated and able to hold their own, that is until they fell for the right man. Given a suitable mate, his female characters, despite their self-actualized nature, would ultimately surrender toward their male counterparts. Still, it is his representations of female protagonists that made for his success in the screwball comedy genre, and Hatari! draws upon these elements for its romance story. Hatari! both fits into Hawks’ traditional style and departs from them in a few significant ways, namely the avoidance of complex camera work. While the shots in the film are not necessarily complex in their composition or framing, the technological achievement and the resulting spectacle of the animal capture scenes is the marvel. While Hatari! came after a slew of other safari films, among them, King Solomon’s Mines (1950, MGM), The African Queen (1951, United Artists), The Snows of Kilimanjaro (1952, Fox), and John Ford’s Mogambo (1953, MGM), Hawks’ safari film is unlike any that came before. 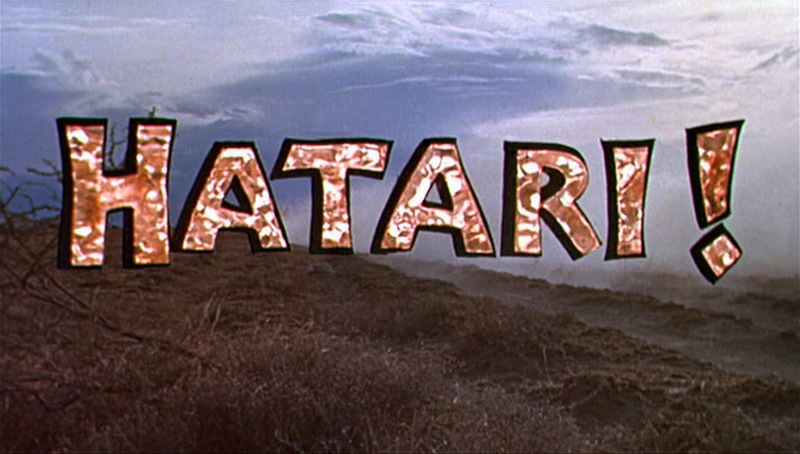 While early safari pictures utilized the spectacle of the African landscape to break from the film’s narrative, Hatari! does the exact opposite by using the narrative to break up the spectacle, a result of that loosely scripted production. The spectacle was made possible both technologically, by the ability to film action scenes with mobile, car-mounted cameras, and stylistically, by filming on location in another continent, away from the influences of studio financiers. Indeed, spectacle is key to the experience of watching Hatari!, filmed on location in Taganyika (modern Tanzania) to take full advantage of the African landscape, including live animals. While the typical safari movie that had dominated the early 50’s was marked largely by actors filmed against rear-projection scenes, intercut with documentary footage to lend credibility to the African setting, Hatari! achieves an almost incomprehensible level of authenticity. Hawks notably encouraged his actors to perform all the animal captures live, with wild, untrained animals. Watching the film it is clear that the movie was made before the limitations of: “No animals were harmed in the making of this film,” as none of what was filmed would be possible under contemporary rules and regulations. In fact, a contemporary film in the vein of Hatari! would need to be nearly all CGI, which is what makes it so impressive in its own right. The spectacle of live animal interaction is the film’s highlight, which features scenes of giraffes and rhinos being chased and captured by the films actors, in jeeps, throughout the rough African landscape. Hawks’ car-mounted cameras follow the cast in both wide and medium shots of action that clearly puts both the actors and wild animals in the same space, bringing authenticity and danger to levels previous films never achieved. But Hawks’ style for Hatari! set the bar for animal/human interaction in action/adventure films, many of the scenes obviously served as the template which could be seen again decades later in Steven Spielberg’s The Lost World: Jurassic Park, though with the comfort of CGI, which didn’t put the actors in harm’s way. As the film’s publicity told us, “Hatari” means “danger,” and danger is definitely the selling point. 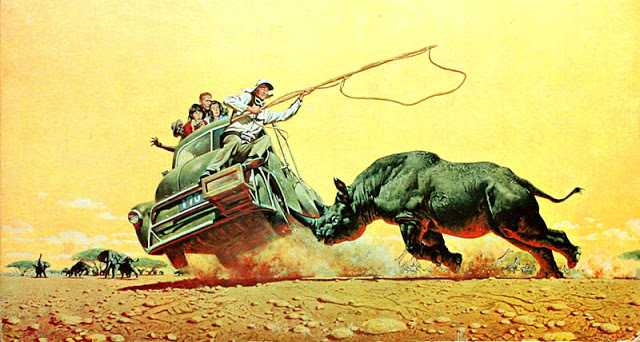 When Wayne’s character wrangles a rhino in the film’s final scenes and the rhino escapes, requiring recapture, that is actually the actors performing the entire scene, not stunt doubles, even when the rhino takes a swipe at Wayne. When Hawk’s mounts an over-the-shoulder shot from inside one of the jeeps, over Wayne’s shoulder in a seat mounted on the front of the car, while he ropes a giraffe, again, that’s actually John Wayne. What is achieved in Hawks’ film may have technologically been impossible only half a decade earlier in the 50’s safari films, since Hatari! required mobile camera equipment to achieve many of the most adventurous and mesmerizing shots in the film. The production and film itself are also emblematic and cumulative of Hawks larger body of work. The auteur, known for his films as much as his relationship to the Hollywood studio system, made Hatari! late in his career. After directing the defining films of many Hollywood genre mainstays, like the gangster, screwball, and Western, including Scarface (1932), Bringing Up Baby (1939), His Girl Friday (1940), The Big Sleep (1946), and Rio Bravo (1959), Hatari!, one of his last films, not only becomes a defining film within the safari genre, it also sums up Hawks’ common, often contentious, relationship with the studio system. Hawks received latitude within the studio system unlike any other director at the time; to limit his commitment to studios he would often sign one or two picture contracts, which was quite rare, and he commonly won arguments with studio executives and triumphed in conflicts. For instance, the resolution to the dispute over the implosion of the production of Hatari! at Warner Bros. resulted in an additional $50,000 from WB for his next production with the studio, Rio Bravo. In fact, part of the selling point for filming in Africa was that it would limit studio interference in his $7 million production. Hatari! is an adventure film unlike any other. At the time it was filmed it defied conventions and broke ground for action filming. However, none of that would have been possible without Hawks, a man who could challenge the studios that produced his films, and brought his own personal desires into the stories he was creating. As an action/adventure film, as a technological marvel, and as one of the last few films Hawks directed, Hatari! is a unique and wild ride. Principal Cast: John Wayne (Sean Mercer), Elsa Martinelli (Dallas), Hardy Kruger (Kurt), Gerard Blain (Chips), Red Buttons (Pockets), Michele Girardon (Brandy), Bruce Cabot (Indian), Valentin de Vargas (Luis).